Feels like lots of work for not much progress really. Started the day driving to woodies and buying a plank of pine to put a shelf in the new garden box to get the lawn seeds and chemicals and stuff off the floor so it’d be less cluttered, and buying a padlock so the newly organised chemicals were out of junior’s reach. 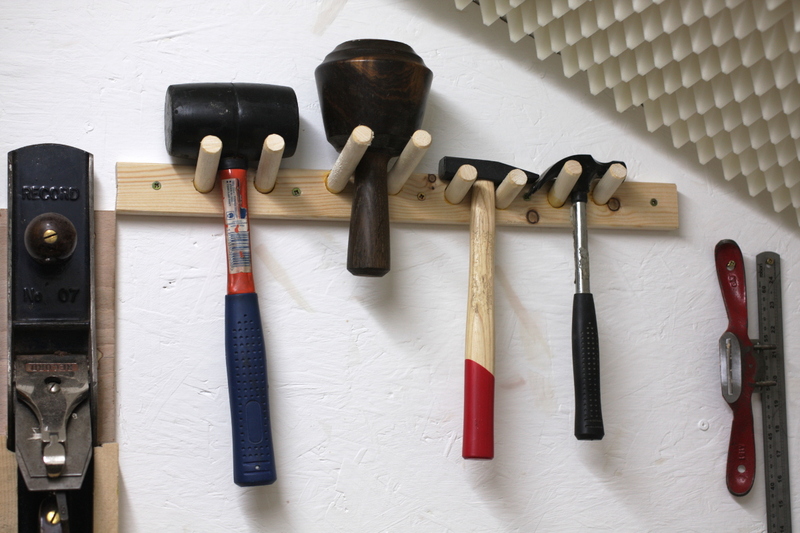 Then finished off the hammer holder. Then took the frame and the door off the shed, and fitted better hinges than the ones that were on it, learning as I went just how much expense was spared when building this shed. Honestly, I’m rather surprised it’s still standing, it was so shoddily assembled. But I got it re-hung on the new hinges after a lot of faffing about to get it to swing cleanly, and then I moved on to changing the hasp from a simple bolt to a van lock type of thing. Which wouldn’t fit. At all. I’d have to hack a four-inch section out of the door frame altogether and even then I’d have to take down the interior wall to fix it properly. By the time I found that out though, I had three new 8mm holes drilled in the door. Ugh. So I reassembled the old crappy hasp, putting screws in all of the screwholes this time just to be wild and carefree about it, and I’ll have to go order another one off ebay tonight. There have been some burglaries around here over the last year or so, no point tempting fate. So after having wasted half a day on that, we then had the trick-or-treaters round for a few hours, and took junior to see his first fireworks, which was fun. By now I’m starting to realise I’ve spent a four-day weekend working on the shed and the crib hasn’t seen much progress. So feck, it’s dark and I can’t get the jig built. I can at least resaw a slat. My new Tyzack 1900s era saw arrived in the post on friday, with a set of teeth on it like it hadn’t been sharpened since it was made. But here’s my new Bahco saw file, one of the best saw files available today according to everyone from Paul Sellers to all the youtubers who copy his stuff ad nauseum (with their own added errors just for fun). If this is the best saw file available today, I think we’d better get used to disposable hardpoint saws. Despite the thing snapping within the handle not just once, but twice, I eventually managed to get some sort of sharpened teeth on the saw (but honestly, I’m going to have to file them all off and recut them from scratch sooner or later, they were in brutal shape), and I resawed one slat with the new saw. 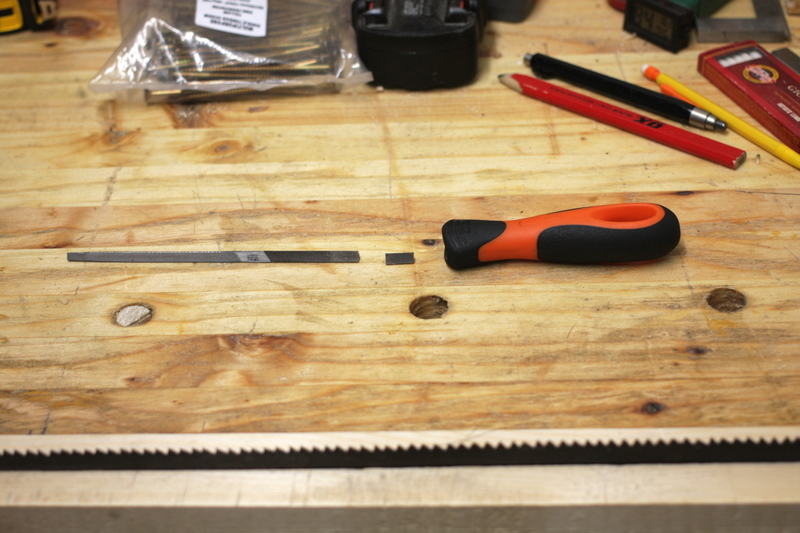 Or rather, I did half of the resawing with the new saw. It does cut, and it’s more steerable than the ryoba if it drifts, but it’s horribly slow by comparison to the ryoba so in the end I just gave up and used the ryoba on it. I don’t know if it’s the teeth on the tyzack or the kerf or what, but it was dog slow getting through that ash. And it splintered the corners on the exit quite a bit, it was not a clean cut. I should be able to use both slats but only because I already finished one face; there’s only enough margin to clean up one face from the cut, it was that bad.